Coalitions in Monkeys and Apes (F.B.M. de Waal). Coalition Formation: A Game-Theoretical Approach (W.J. van der Linden and A. Verbeek). 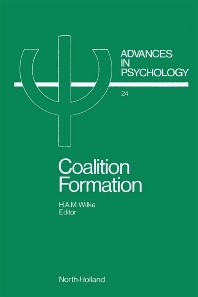 Coalition Formation from a Socio-Psychological Perspective (H.A.M. Wilke). Legislative Analysis: Methodology for the Analysis of Groups and Coalitions (R.J. Mokken and F.N. Stokman). Coalition Theory and Multi-Party Systems. Formal-Empirical Theory and Formalizing Approach to Politics (A. de Swaan). References. Index. A comprehensive view of coalition formation is presented here. Each of the chapters gives a summary of theories and research findings in a specific field of interest, at various levels of human and primate organisation.